We are a Male Voice Choir with about 40 active Choristers, divided into the normal Sections used by Male Voice arrangements: First Tenor, Second Tenor, Baritone and (Second) Bass. Our Principal Conductor is William Barr and our Accompanist is Silviya Mihaylova. The President is Roy Henderson, and the Secretary is Kenny Brown. We are based in Glasgow, as our name suggests, but our members are from all parts of West and Central Scotland, and we meet in Glasgow every week for rehearsal during the Winter (September to May). 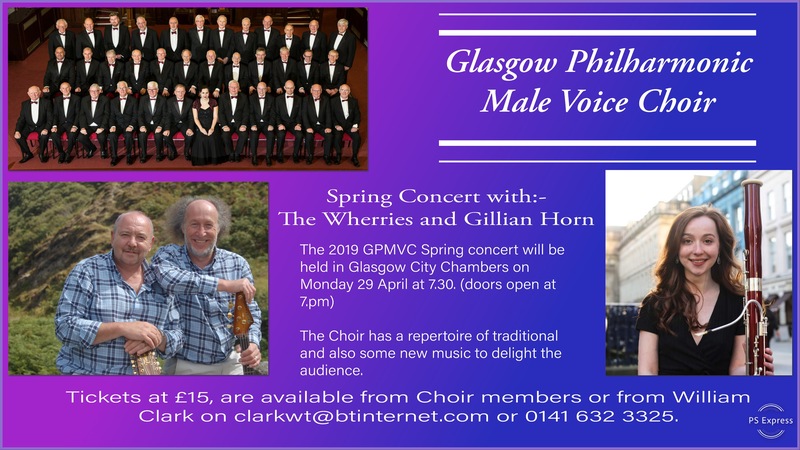 The Glasgow Philharmonic Choir was formed from the Partick Male Voice Choir in 1925. The History link gives a more detailed history of the Choir, first written for our 75th Anniversary Concert in April 2000 and updated to the present. We rehearse in Renfield St Stephen’s Church Centre, 260 Bath Street, Glasgow, G2 4JP, from 6:45pm to 9:15pm every Tuesday evening from the beginning of September to May. Please get in touch using the “Contact Us” page for further information.